Damage to the roof of a tour boat after an explosion sent lava flying through the roof off the Big Island of Hawaii, Monday, July 16, 2018, injuring at least 23 people. The lava came from the Kilauea volcano, which has been erupting from a rural residential area since early May. 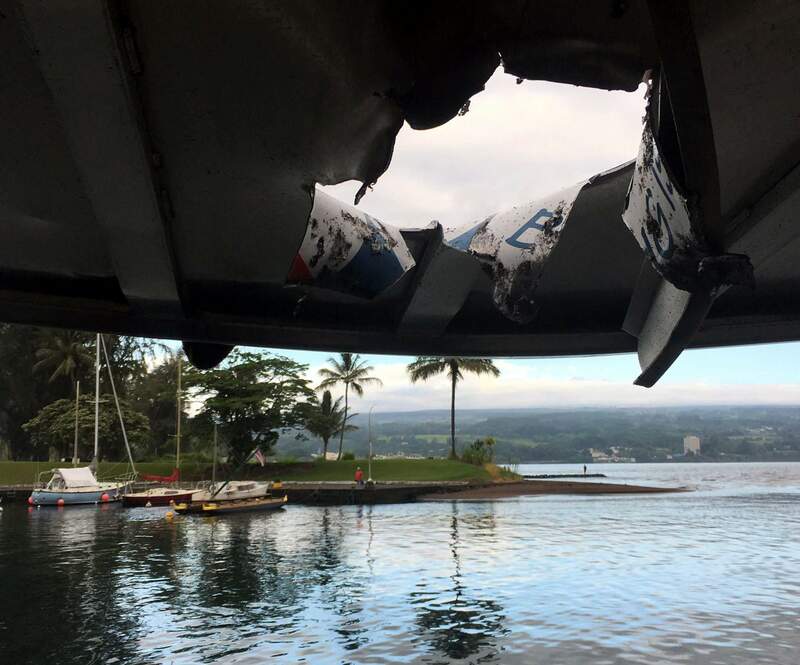 HONOLULU – A passenger on a tour boat that was struck by lava off Hawaii’s Big Island last week shielded his girlfriend and waited for death as searing debris came ripping through the catamaran’s roof. 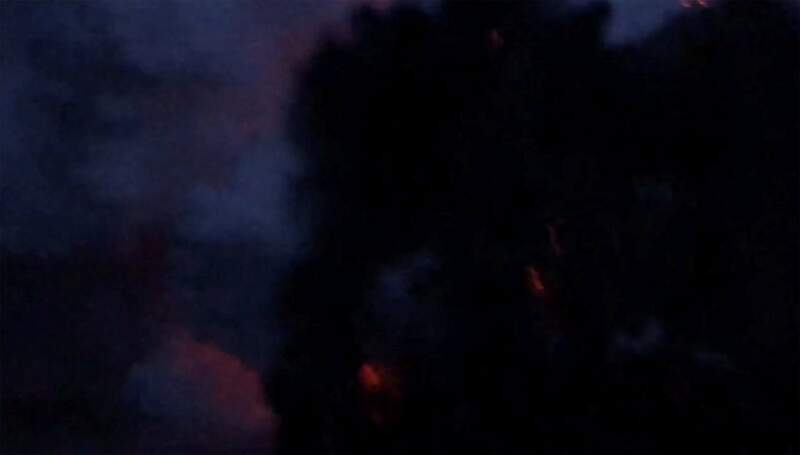 In this image taken from video provided by Will Bryan, the glow of lava from Hawaii’s Kilauea volcano is seen through a plume of gas as it enters the ocean near Kapoho, Hawaii. Bryan, a paramedic who was on vacation in Hawaii when the accident happened, says both he and his girlfriend, Erin Walsh, suffered burns and cuts from the volcanic debris that hit the tour boat they were on. A police officer secures the tour boat “Hot Spot” for the arrival of inspectors in Hilo, Hawaii. An explosion caused by lava oozing into the ocean sent molten rock crashing through the roof of the boat, injuring 23 people. 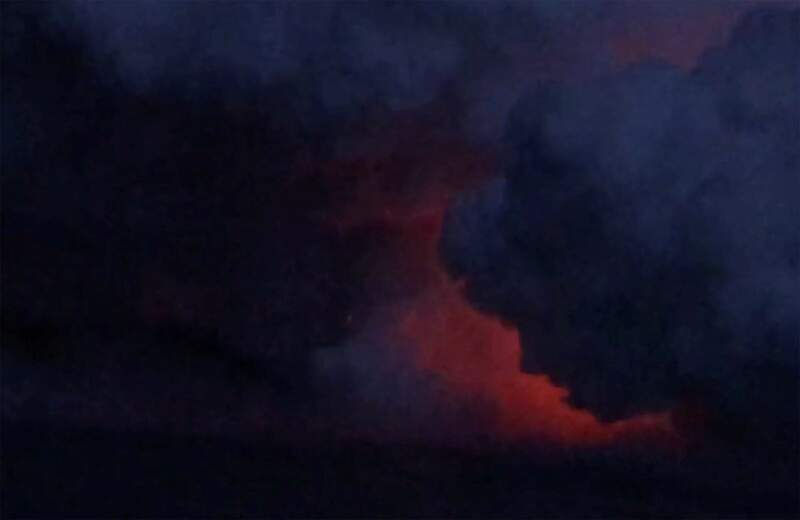 In this image taken from video provided by Will Bryan, lava and debris, foreground and right, from Hawaii’s Kilauea volcano explodes from the ocean, near Kapoho, Hawaii. Bryan and his girlfriend suffered burns and cuts from the volcanic debris. 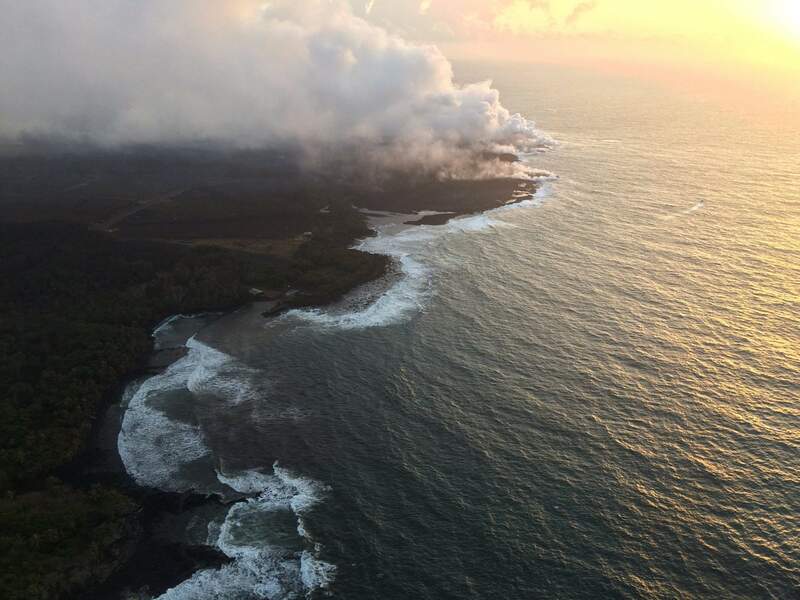 Lava from Kilauea volcano enters the ocean on Hawaii’s Big Island on July 23, 2018. 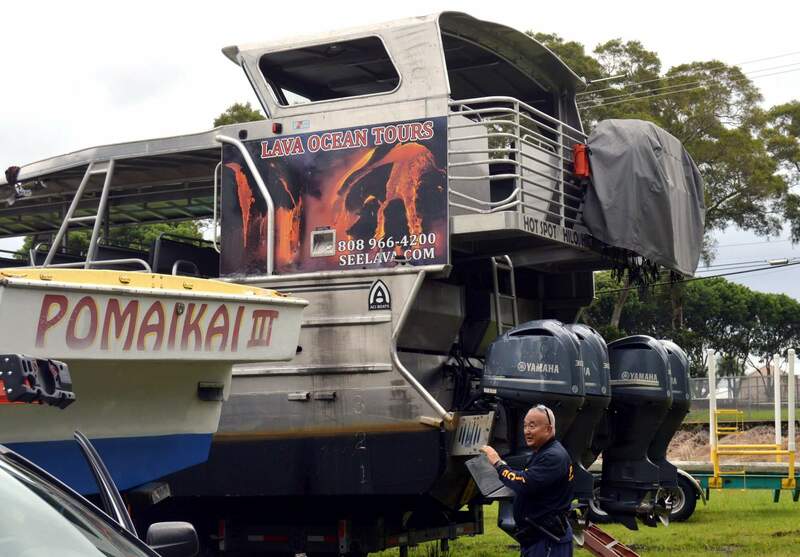 A passenger on a lava tour boat near the volcano says he thought he was going to die when molten rock blasted out of the sea a week earlier and struck the vessel he was on. 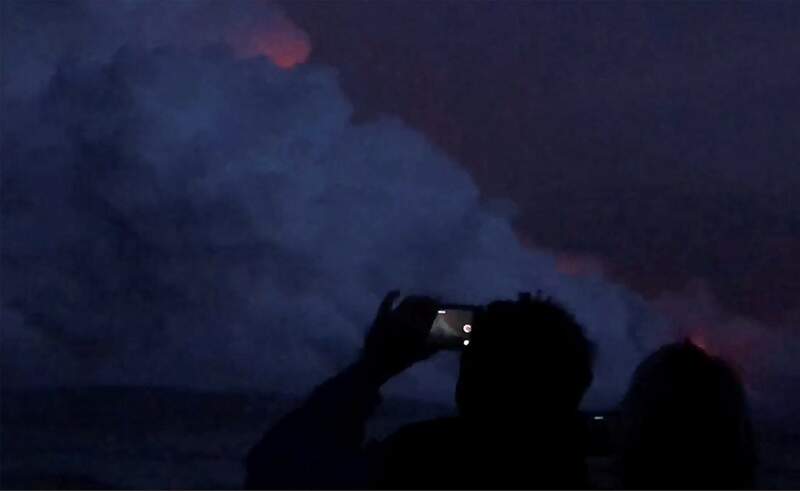 In this image taken from video provided by Will Bryan, tourists watch as lava from Hawaii’s Kilauea volcano enters the ocean near Kapoho, Hawaii. Bryan, a paramedic who was on vacation in Hawaii when the accident happened, says both he and his girlfriend, Erin Walsh, suffered burns and cuts from the volcanic debris. Walsh was taking video and photos with her cellphone before the explosion. She doesn’t remember much after that, and even the images she took before the explosion are gone.